All we really wanted was a summer exhibit. That was how it started. Four museum staff members around a table, discussing ideas. The next Monday, Callie brought in a car trunk full of kites and reference books, and our discovery of kites had begun. 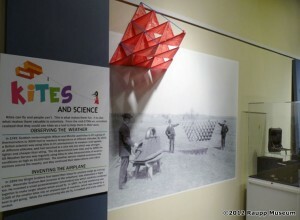 While it was easy to appreciate their artistry, as a history museum, we wanted to focus on that part of the kite story. Not just the history of kites, but also the role kites had played in history. Although we originally worried there wouldn’t be enough material (Ben Franklin, and then what?) soon we had divided everything up into categories, and actually needed to edit things down. Kites and Science would cover weather observations, flight, aerial photography, and bridge construction, with a special tip of the hat to Ben Franklin and Alexander Graham Bell. Kites and War would go from ancient times through WWII, and include the Cody Manlifter kites, Paul Garber’s target kites, and the Gibson Girl kite. Kites and Sport would fly from the air to the sea and back again—from kite fishing to kite surfing, and include the sports made possible by the modern kite innovations of Domina Jalbert and Francis Rogallo. A video of sport kites would also play, showing our guests that kites really could dance. Kites and Kids showed kids learning the art and science of flying—from kite contests at local schools, to Hi-Flier kits from the drugstore. Special recognition was given to the 1916 book The Boy Mechanic, which included directions for three different kites—a box kite, a tailless kite, and a fighting kite with the kite line coated in broken glass. Finally, World Kites showcased kites and kite traditions from around the globe. 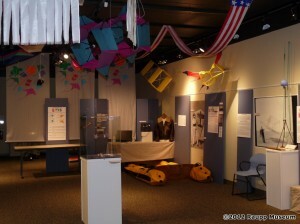 Over forty kites are now on display at the museum, as well as two videos, and a hands-on kite making station. 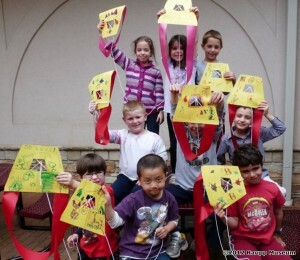 Additional signs explain the anatomy of a kite and how to fly a kite. What has been the staff’s favorite thing? Probably the tetrahedral kite we made ourselves. During our research we were so amazed by the kites made by Alexander Graham Bell that when we found instructions for a small model that could be made from soda straws and tissue paper, we decided to give it a try. Later that afternoon, to our utter delight, a small red pyramid-shaped kite was flying in the museum parking lot. “It works!” We were all grinning, astounded that something that shape, something that we had made ourselves, could actually fly. We now understood the magic of kites. Major inspiration and information for this exhibit was provided by Callie McCune and her father Tom McCune. Any mistakes are not their fault. 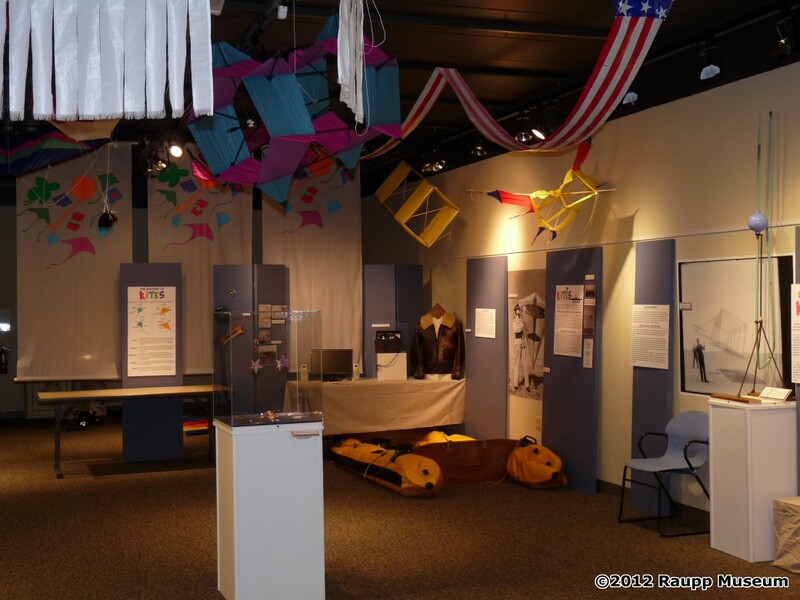 This entry was posted in Kiting Experience, KL Archive and tagged Buffalo Grove, exhibit, museum, Raupp.